Law enforcement agencies have a new iPhone cracking tool that works with all modern iPhones and the newest versions of iOS 11, the GrayKey, designed by a company called Grayshift. Previous reports have suggested the GrayKey can crack 4-digit passcodes in a matter of hours and 6-digit passcodes in days, but as highlighted by VICE’s Motherboard, cracking times for the GrayKey and other similar iPhone unlocking methods can potentially be even faster and 6-digit passcodes no longer offer adequate protection. Matthew Green, assistant professor and cryptographer at John Hopkins Information Security Institute, said this morning on Twitter that with an exploit that disables Apple’s passcode-guessing protections, a 4-digit passcode is crackable in 6.5 minutes on average, while a 6-digit passcode can be calculated in 11 hours. Apple does have built-in options to erase an iPhone after 10 incorrect passcode guessing attempts and there are automatic delays after a wrong passcode has been entered more than five times, but GrayKey appears to bypass these protections. It’s not clear if the GrayKey can reach the fastest unlocking times outlined by Green, but even at slower unlocking speeds, it only takes days to get into an iPhone with a 6-digit passcode. Comparatively, it takes over a month to crack an iPhone with an 8-digit passcode, or more than 13 years to get into an iPhone with a 10-digit passcode. With the release of iOS 9 in 2015, Apple switched from a four digit passcode to a 6-digit passcode as the default, making iOS devices more secure, but for those concerned about their iPhones being accessed either by law enforcement with the GrayKey or by a hacker with a similar cracking tool, a 6-digit passcode is no longer good enough. 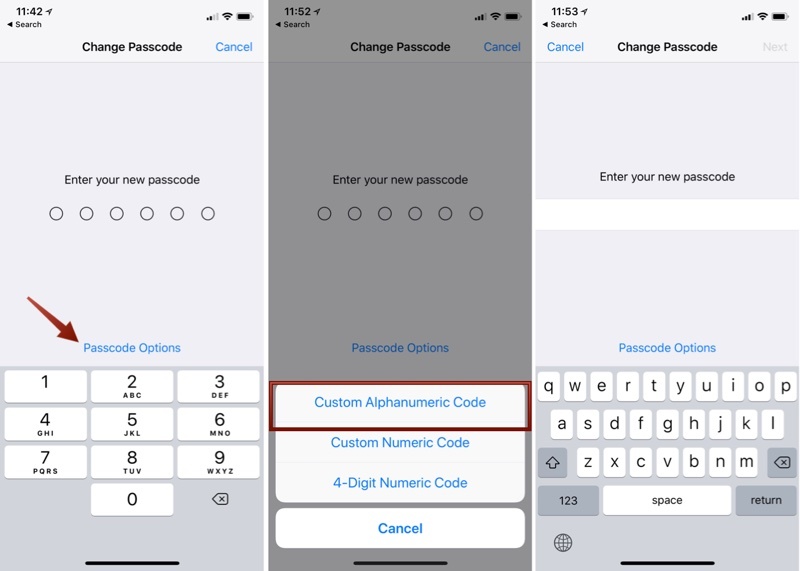 Several security experts who spoke to Motherboard said people should use an alphanumeric passcode that’s at least seven characters long and uses numbers, letters, and symbols. You’ll be asked to enter your new passcode on this screen, but you’ll actually want to tap on the blue “Passcode Options” text towards the middle of the display. Choose “Custom Alphanumeric Code” to enter a passcode that consists of letters, numbers, and symbols. With an alphanumeric passcode in place, you’ll no longer be presented with a numeric keyboard when unlocking your iPhone, and instead, you’ll see a full keyboard available to type in your passcode. There’s a definite compromise between easy device accessibility and security when using a longer alphanumeric passcode like this. It’s a lot easier to type six numbers than it is to type a mixed character alphanumeric passcode into an iOS device, but for complete security, longer and more complex is the way to go.